in which are inscribed the names of all natives of Somerset who fell in the war, irrespective of the Fighting Service to which they belonged, or the Unit in which they served, as well as the names of all those who, though not Somerset born, lost their lives while serving in County Units, contains in all a roll of honour comprising nearly 11,300 names. Those of the Somerset born, who exceed 8,000, are recorded parish by parish arranged in alphabetical order-the lists having been mostly compiled by the Incumbents-the work in connection with which in large parishes often involved much difficulty and expenditure of time, a labour of love on their part, which the Committee much appreciate. which have been issued in no fewer than 81 separate parts. The names in this case have been drawn up by Units and so entered in the Memorial Book. The latter has, as already stated in this Report, been deposited in St. Martin's Chapel, in Wells cathedral, in a glass case; a photographic copy of the work, to which the public has at all times access, is kept, too, in the chapel for purposes of consultation. Lastly, there is a third volume, being a bound copy of this Report with the alphabetical list of the Fallen, from which can be found the number of the page of the Memorial Book on which any particular name occurs. The Council of the Somerset Archaeological Society has also accepted for its library the Committee's gift of five bound volumes containing 42 of the 81 Parts comprising the War Office lists compiled regimentally of officers and soldiers who fell in the war, as well as the scrap book containing newspaper cuttings from the files of the local Press and dealing with those memorial matters to which reference has from time to time been made in their columns during the years the Fund has been before the public. This beautifully proportioned volume is composed Of 220 pages of the finest vellum, on which are inscribed the names Of 11,281 of those of the County of Somerset who fell in the Great War. The decorative borders surrounding the names have been varied on each double page all through the book. Into the designs are introduced no less than 440 panels illustrative of the county of Somerset. Each place is represented by some characteristic decoratively treated : the church towers, village crosses, monuments, views, armorial bearings, and other insignia are all incorporated, the Somerset note being dominant throughout. The designing of the work is appropriately carried out in a modern spirit of decoration contemporary with the period it records, rather than as a reproduction of the work of mediaeval illuminators. 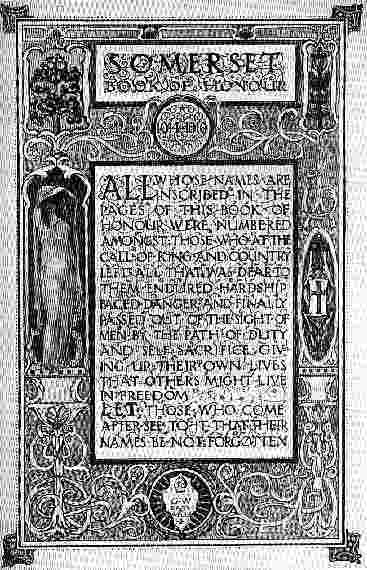 "All whose names are inscribed in the pages of this Book of Honour were numbered among those who at the call of King and Country left all that was dear to them, endured hardship, faced danger, and finally passed out of the sight of men by the path of duty and self-sacrifice, giving up their own lives that others might live in Freedom. Let those who come after see to it that their names be not forgotten." The title page is elaborately illuminated-a feature of the border is a figure symbolic of grief in violet drapery, standing against a background of burnished gold. Other panels in the border are filled with a conventional treatment of apple trees. These panels are connected with a graceful flowing ornament in creamy white on a ground work of blue and gold diaper. The book is bound in stout, undyed hog-skin; a special skin was selected, and it was tanned and prepared under expert and direct supervision. Into the front cover are inlaid 12 panels in colour protected by a covering of transparent vellum. The centre panel depicts the figure of an angel with uplifted arms, the feet resting on a globe of inlaid mother of pearl, from which spring rays, alternated with gold mosaic. Other panels are embellished with appropriate ornament and iridescent shell, giving a brilliant jewel-like effect. The panels are connected with bands of leather Of darker hue, and a rich frame work of gold tooling, introducing the Rose, Shamrock, and Thistle, binds the design together. The doublures in harmony with the binding are carried out in colour, covered with transparent vellum, tooled on the surface. 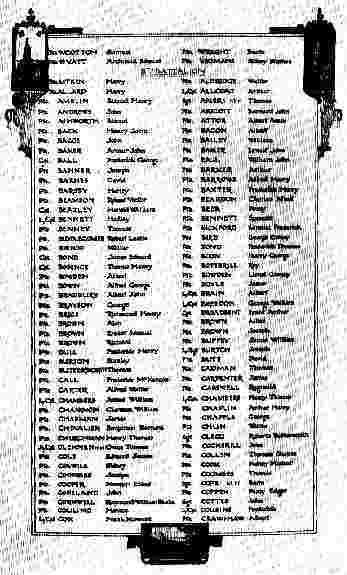 The names have been carefully inscribed in the book, Christian names, rank and regiment of each man appear in full. Legibility and character are the distinguishing qualities of the lettering used, which is formed on the best examples, a jet black ink of guaranteed permanency being the medium employed. The book is held together in an indestructible fashion, and can only come apart as the book itself decays, which, if proper care is taken with its housing, should be postponed for hundreds of years. Each page is vellum hinged in the sewing, every stitch is knotted and has been made a decorative feature of the page. The work has been carried out by Cedric Chivers, Ltd., of Portway, Bath, Somerset. Mr. Cedric Chivers has personally supervised the construction of the binding throughout its varied processes. Among all historic books of vellum, we know of no other the leaves of which open perfectly flat. 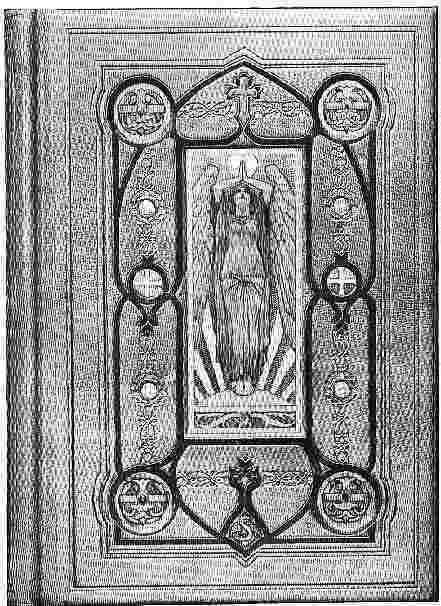 Mr.Samuel Poole (the Firm's artist) was engaged for eighteen months upon the illuminating of the pages and inscribing of the names, together with the decoration of the covers. * Born 1845, died 1922, resigned the Bishopric in 1921.